Introducing the BMW X4. The truly head turning example of the X range. Combing the striking looks of a coupe with typical X-power performance. Powered by the BMW Twin Power Turbo engine and with equipment such as Variable Sport Steering and drive performance control, the BMW X4 demonstrates an amazing combination of power and performance. 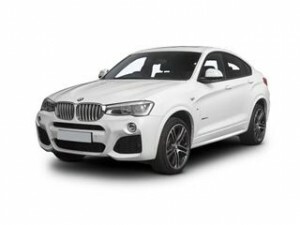 The X4 comes in 2 models, the xLine and M Sport model. Both capable of sleek performance with striking looks. The off-road look and coupe sloping roof makes this a unique car. Both models come with a vast choice of spec, finishes and engines, so there’s something for everyone. BMW’S clever Comfort Access system is included as standard, allowing you to open the doors and start the engine without having to use the key. The Smart Opener function is also included which allows you to open the boot with a wave of your foot. Despite its size and performance the BMW X4 continues to be very economical, returning up to 57mpg. Acceleration is equally impressive with 0-62mph taking just 8 seconds on the standard model. Also included are such features as iDrive, a 6.5 inch display, park distance control, xenon headlights and a whole lot more. All typical of the standard BMW has come to be known for. Coast2CoastCars work exclusively with a UK wide network of BMW dealers who have the facility to reduce the price considerably. The choice of spec is entirely up to as well, use our online quoting system today.